Welcome to Nutrition For Performance’s first ever Review of Food! Our goal is to give you, the consumer, a review of the latest food/supplement products from a Dietitian’s point of view. This will allow you to bypass all the elaborate marketing tactics and give you the raw data behind the foods you consume. We will discuss taste, texture, nutritional implications and cost. Before we go any further, we want you to know that we are no way affiliated with these companies. We are not getting paid to do this. We simply want to provide our followers with professional insight that will empower them to make educated decisions when it comes to the foods they buy. This is a no BS review and we will simply state the facts. So without further ado, lets dive right in to this week’s Review of Food! 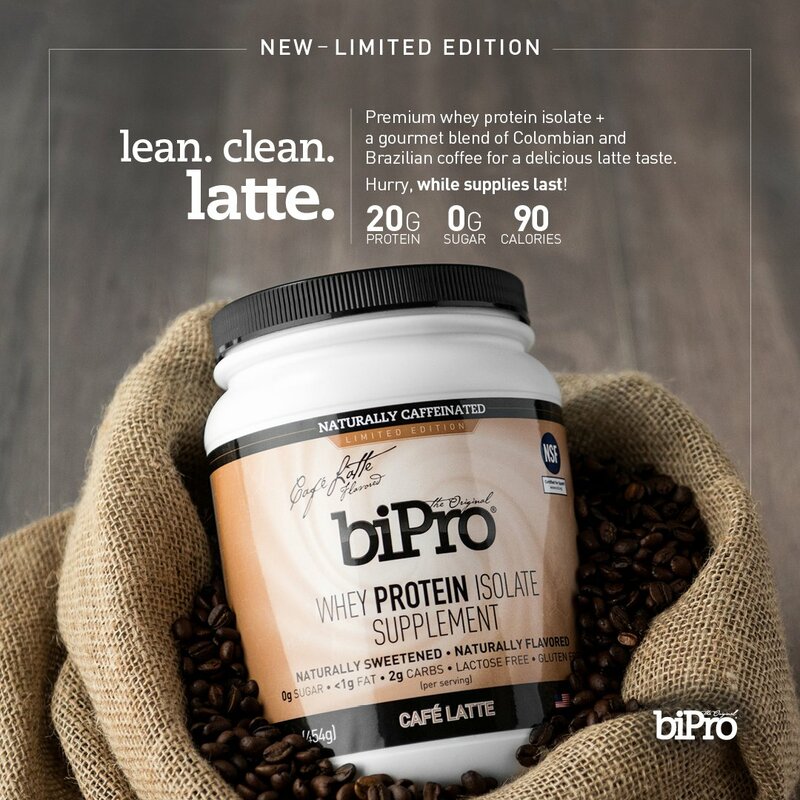 What: BiPro® Cafe Latte *Limited Edition*. A new flavor to the whey protein line, BiPro cafe latte has combined premium whey protein for muscle growth with a delicious blend of Columbian/Brazilian coffee for added energy. Taste: Like other BiPro whey protein flavors, they really hit it out of the park with this one. Once again, they have completely eliminated that typical protein powder chalk taste and given us a product that makes you feel like you are in your neighborhood coffee store sipping on your favorite frothy beverage. The taste does vary depending on which base you decide to use, but the cafe latte flavor is still at the forefront. We mixed 1 serving with water, milk (1%), and almond milk, with milk being the favorite. If you absolutely have to mix it with water, it tastes ok to drink on the run (like mostly all other whey powders), but not the recommended base if your are a big flavor person. **Golden nugget: For extra coffee flavor and a bit more zing to your energy meter, mix in your favorite coffee or espresso. Texture/Mixability: This new flavor of protein powder mixes nicely with any base you decide to choose. For this review, we used both the blender bottle and the blender. There really is not a difference in texture or mixability between the two. I prefer this flavor with a slightly thicker consistency, so I opt for low-fat milk rather than the water counterpart. BiPro cafe latte provides you with a lean protein isolate as well as a touch of energy through the instant coffee they place into the powder. This product can be used as both a pre- and/or post-workout protein supplement. CAUTION: Since this products contains caffeine be sure that it doesn’t interrupt your sleeping pattern. If using to help fuel or recover from a workout be sure to include a carbohydrate source, whether it be a banana or a sweetener, like honey. Whether you want to gain, maintain, or lean out, BiPro cafe latte can help you meet your needs. All BiPro products are also NSF certified for sport®. **Note: Be sure to consult with your physician if you have heart conditions that can be affected by the effects of caffeine. Cost: You definitely get what you pay for when it comes to the cost of this product. You are paying for the protein, not tons of fillers. For a 1lb tub of this delicious goodness, it will cost you $24.99 for 18 servings. If you use protein powders more than once daily, the cost can add up. There you have it! Thank you for taking the time to read through NFP’s first Review of Food! For those that made it this far, we want to thank you by giving you a special something. Simply use the promo code BP10 and receive $10 off any 2lb tub of BiPro. For more information visit BiPro at www.biprousa.com. If there are any food products or supplements that you would like NFP to review, comment below! Check us out on Facebook (www.facebook.com/NFPMIA/) and Instagram for more.